View of the façade of the church from St Peter's square. The Church of Saints Martin and Sebastian of the Swiss (Italian: Santi Martino e Sebastiano degli Svizzeri) is a Roman Catholic oratory in Vatican City. The church was built by Pope Pius V in 1568 to serve as private chapel for the Pontifical Swiss Guards, whose barracks are located next to Porta San Pellegrino, close to the Apostolic Palace. It is considered the national church of Switzerland in Rome. The chapel is conveniently located on the path taken everyday by the Guards from their barracks to Portone di Bronzo. It is accessible for the guards, day and night. Baptisms and marriages of members of the Guard can also be celebrated with the permission of the priest of the parish of Saint Anne in Vatican. 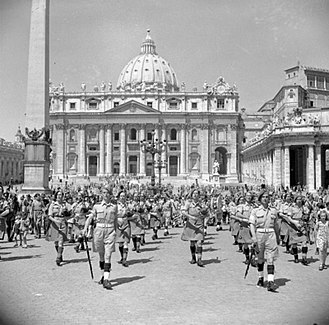 The Swiss Guards arrived at the service of the Pope in Rome in 1506. Pope Pius V ordered the construction of a chapel strictly reserved for the Guards behind the bastion of Nicholas V. The construction of the building dates back to 1568 under the direction of architect Nanni di Baccio Bigio. The church was dedicated to Saint Martin of Tours and Saint Sebastian, both soldiers. (The patron saint of Switzerland, however, is Nicholas of Flüe, who was canonized in 1947 by Pope Pius XII.) Saint Martin was an officer in the Roman army who withdrew to the ascetic and monastic life after his conversion. Saint Sebastian was appointed as a captain of the Praetorian Guard of Roman emperors Diocletian and Maximian and was martyred. 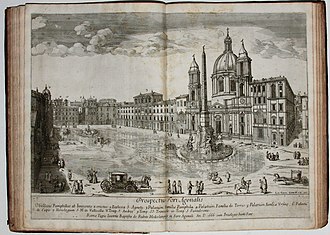 Until the 1648 Peace of Westphalia, the German-speaking Swiss Guards gathered in the church of Santa Maria della Pietà in Campo Santo Teutonico, where there was a side altar reserved for them. From 1657 to 1977, the Guards also used the church of Saint Peregrine in the Vatican (Italian: San Pellegrino in Vaticano) for their religious services. The classical façade consists of four large Doric columns supporting an entablature, but the inscription "Pius V P.M." mentioned by Forcella has disappeared. The pediment, which does not occupy the entire roofline, is decorated with the arms of Pius V. The doorway is surmounted by a small triangular pediment, surmounted by a large porthole. In 1999 the building was enlarged with a forum. The chapel was decorated with frescoes by Giulio Mazzoni, a pupil of Vasari. The frescoes were renovated in the years 1727–1728 by Carlo Roncelli and were finally removed in 1967 for conservation purposes and stored in the Vatican Museums. The frescoes over the altar represent God the Father, while in the right-hand niche is St. Sebastian, and in the left one St. Martin. The altarpiece represents the Annunciation of the Virgin Mary. On the right wall, near the altar, Jesus Christ is depicted on the cross, surrounded by St. Peter and St. John the Evangelist; on the left is the Virgin Mary with St. Anne and the child Jesus. Mazzoni collaborated with stuccoist Ferrante Moreschi, who had made part of the stucco of the Sala Regia in 1565. ^ Di Gregorio, Monica (2002). "Carlo Roncalli, "pittore di Casa Albani", ed Emanuele Alfani nel restauro della Galleria delle Carte Geografiche in Vaticano". Bollettino d'arte — Ministero dell'educazione nazionale (in Italian). La Libreria dello Stato. 122: 33. Retrieved 13 May 2011. Baumgarten, Paul Maria (1913). 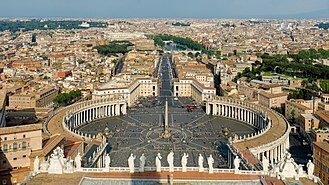 "The Vatican". In Herbermann, Charles. Catholic Encyclopedia. New York: Robert Appleton Company. Wikimedia Commons has media related to Santi Martino e Sebastiano degli Svizzeri. A porthole, sometimes called bulls-eye window or bulls-eye, is a generally circular window used on the hull of ships to admit light and air. Though the term is of maritime origin, it is used to describe round windows on armored vehicles, automobiles. On a ship, the function of a porthole, when open, is to light and fresh air to enter the dark. It affords below-deck occupants a limited, but often much needed view to the outside world, when closed, the porthole provides a strong water-tight, weather-tight and sometimes light-tight barrier. A porthole on a ship may be called a sidescuttle or side scuttle and this term is used in the U. S. Code of Federal Regulations. It is used in related rules and regulations for the construction of ships, the use of the word sidescuttle instead of porthole is meant to be broad, including any covered or uncovered hole in the side of the vessel. According to the Navy Department Library, the word porthole has nothing to do with its location on the side of a ship. The king insisted on mounting guns too large for his ships, a French shipbuilder named James Baker was commissioned to solve the problem, which he did by piercing the ships sides so the cannon could be mounted inside the fore and after castles. For heavy weather and when the cannons were not in use, the openings were fitted with covers, porte was Anglicized to port and corrupted to porthole. Eventually, it came to any opening in a ships side whether for cannon or not. A porthole consists of at least two components and is, in its simplest form, similar to any other type of window in design. The porthole is primarily a circular glass disk encased in a frame that is bolted securely into the side of a ships hull. Sometimes the glass disk of a porthole is encased in a frame which is hinged onto the base frame so that it can be opened and closed. In addition, many have metal storm covers that can be securely fastened against the window when necessary. The main purpose of the cover is, as its name implies. It is classified as a semi-official newspaper of the Holy See, but is not an official newspaper. 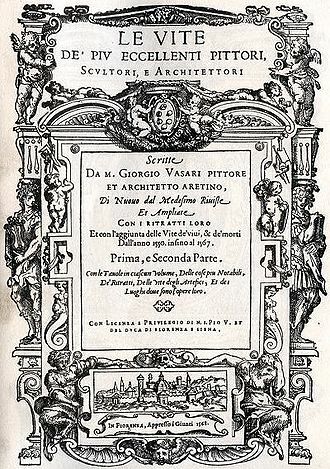 The publication prints two Latin mottoes under the masthead of each edition, Unicuique suum and Non praevalebunt, the current editor-in-chief is Giovanni Maria Vian. He further described the publication as an instrument for spreading the teachings of the successor of Peter, the weekly English edition is distributed in more than 129 countries, including both English-speaking countries and locales where English is used as the general means of communication. The first issue of LOsservatore Romano was published in Rome on 1 July 1861 and this agenda supported the notion of a daily publication to champion the opinions of the Holy See. By July 1860, the deputy Minister of the Interior, Marcantonio Pacelli, had plans to supplement the official bulletin Giornale di Roma with a semi-official rhetorical publication, in early 1861, controversialist Nicola Zanchini and journalist Giuseppe Bastia were granted editorial direction of Pacellis newspaper. 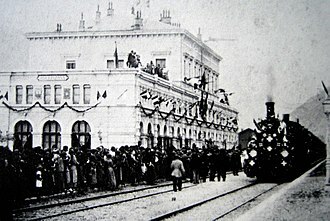 Official permission to publish was sought on 22 June 1861, and four days later, on 26 June, the first edition was entitled LOsservatore Romano – a political and moral paper and cost five baiocchi. The political and moral paper epithet was dropped before 1862, adding instead the two Latin mottoes that still appear under the masthead today, the editors of the paper initially met in the Salviucci Press on the Piazza de Santi Apostoli, where the paper was printed. Only when the staff was established on the Palazzo Petri in Piazza dei Crociferi. Soon after, LOsservatore began to replace the Giornale di Roma as the organ of the Pontifical State. This development was obvious during the pontificate of Pope Leo XIII, the English weekly edition was first published on 4 April 1968. On 7 January 1998, that became the first to be printed outside of Rome. The edition was printed by the Cathedral Foundation, publishers of The Catholic Review, for instance, a 2008 article expressed the wish that the debate on brain death be re‑opened because of new developments in the medical world. Pope Pius XII, born Eugenio Maria Giuseppe Giovanni Pacelli, reigned as Pope from 2 March 1939 to his death in 1958. After the war Pius XII advocated peace and reconciliation, including lenient policies towards Axis, the Church experienced severe persecution and mass deportations of Catholic clergy in the Eastern Bloc. Pius XII was an opponent of Communism and of the Italian Communist Party. He explicitly invoked ex cathedra papal infallibility with the dogma of the Assumption of Mary in his 1950 Apostolic constitution Munificentissimus Deus and his magisterium includes almost 1,000 addresses and radio broadcasts. His forty-one encyclicals include Mystici corporis, the Church as the Body of Christ, Mediator Dei on liturgy reform and he eliminated the Italian majority in the College of Cardinals in 1946. In 1954, Pius XII began to suffer ill health. The embalming of his body was mishandled, with effects that were evident during the funeral and he was buried in the Vatican grottos and was succeeded by Pope John XXIII. In the process toward sainthood, his cause for canonization was opened on 18 November 1965 by Pope Paul VI during the session of the Second Vatican Council. He was made a Servant of God by Pope John Paul II in 1990, Eugenio Maria Giuseppe Giovanni Pacelli was born on 2 March 1876 in Rome into a family of intense Catholic piety with a history of ties to the papacy. His parents were Filippo Pacelli and Virginia Pacelli, together with his brother Francesco and his two sisters and Elisabetta, he grew up in the Parione district in the centre of Rome. Soon after the family had moved to Via Vetrina in 1880 he began school at the convent of the French Sisters of Divine Providence in the Piazza Fiammetta, the family worshipped at Chiesa Nuova. Eugenio and the children made their First Communion at this church. In 1886 too he was sent to the school of Professor Giuseppe Marchi. In 1891 Pacellis father sent Eugenio to the Liceo Ennio Quirino Visconti Institute, a school situated in what had been the Collegio Romano. An entablature refers to the superstructure of moldings and bands which lie horizontally above columns, resting on their capitals. Entablatures are major elements of architecture, and are commonly divided into the architrave, the frieze. 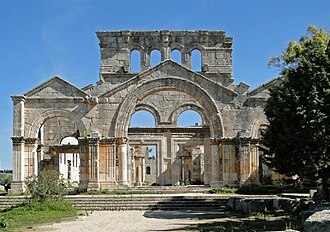 The Greek and Roman temples are believed to be based on wooden structures, the structure of the entablature varies with the three classical orders, Doric and Corinthian. In each, the proportions of the subdivisions are defined by the proportions of the column in the order, in Roman and Renaissance interpretations, it is usually approximately a quarter of the height of the column. Variants of entablature that do not fit these models are derived from them. Pure classical Doric entablature is simple, the architrave, the lowest band, is split, from bottom to top, into the guttae, the regulae, and the taenia. The frieze is dominated by the triglyphs, vertically channelled tablets, separated by metopes, which may or may not be decorated. The triglyphs sit on top of the taenia, a flat, horizontal protrusion, and are finished at the bottom by decoration of drops, called guttae, the top of the triglyphs meet the protrusion of the cornice from the entablature. The underside of this protrusion is decorated with mutules, tablets that are finished with guttae. The cornice is split into the soffit, the corona, the soffit is simply the exposed underside. The corona and the cymatium are the parts of the cornice. The Ionic order of entablature adds the fascia in the architrave, which are flat horizontal protrusions, and the dentils under the cornice, which are tooth-like rectangular block moldings. The Corinthian order adds a far more ornate cornice, from bottom to top, into the cyma reversa, the dentils, the ovulo, the modillions, the fascia, and the cyma recta. The modillions are ornate brackets, similar in use to dentils, the frieze is sometimes omitted—for example, on the portico of the caryatides of the Erechtheum—and probably did not exist as a structure in the temple of Diana at Ephesus. Neither is it found in the Lycian tombs, which are reproductions in the rock of timber based on early lonian work. The entablature is essentially an evolution of the lintel, which spans two posts, supporting the ends of the roof rafters. 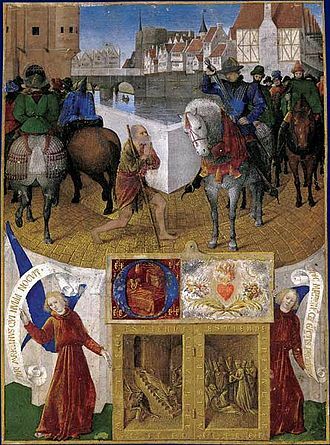 St. Martin of Tours was Bishop of Tours, whose shrine in France became a famous stopping-point for pilgrims on the road to Santiago de Compostela in Spain. He has become one of the most familiar and recognizable Christian saints, sometimes venerated as a military saint. 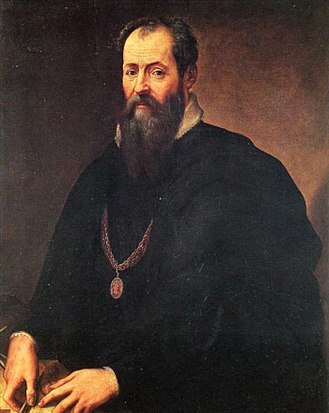 As he was born in what is now Szombathely, spent much of his childhood in Pavia and his life was recorded by a contemporary, the hagiographer Sulpicius Severus. Some of the accounts of his travels may have been interpolated into his vita to validate early sites of his cult. He is best known for the account of his using his sword to cut his cloak in two, to give half to a beggar clad only in rags in the depth of winter. Conscripted as a soldier into the Roman army, he found the duty incompatible with the Christian faith he had adopted, Martin was born in 316 or 336 AD in Savaria in the Diocese of Pannonia. His father was an officer in the Imperial Horse Guard, a unit of the Roman army, stationed at Ticinum, in northern Italy. The date of his birth is a matter of controversy, with both 316 and 336 having rationales, at the age of ten he attended the Christian church against the wishes of his parents, and became a catechumen. Christianity had been made a religion in the Roman Empire. It had many adherents in the Eastern Empire, whence it had sprung. Christianity was far from accepted amongst the higher echelons of society, although the conversion of the Emperor Constantine and the subsequent programme of church-building gave a greater impetus to the spread of the religion, it was still a minority faith. 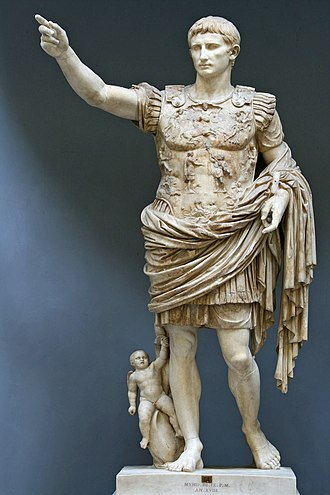 As the son of an officer, Martin at fifteen was required to join a cavalry ala. At the age of 18 around 334 or 354, he was stationed at Ambianensium civitas or Samarobriva in Gaul and it is likely that he joined the Equites catafractarii Ambianenses, a heavy cavalry unit listed in the Notitia Dignitatum. Jacques Fontaine thinks that the biographer was somewhat embarrassed about referring to long stint in the army and he was charged with cowardice and jailed, but in response to the charge, he volunteered to go unarmed to the front of the troops. His superiors planned to take him up on the offer, but before they could, the invaders sued for peace, the battle never occurred, and Martin was released from military service. An architectural style is characterized by the features that make a building or other structure notable or historically identifiable. A style may include such elements as form, method of construction, building materials, styles therefore emerge from the history of a society. They are documented in the subject of architectural history, at any time several styles may be fashionable, and when a style changes it usually does so gradually, as architects learn and adapt to new ideas. Styles often spread to places, so that the style at its source continues to develop in new ways while other countries follow with their own twist. A style may spread through colonialism, either by foreign colonies learning from their home country, one example is the Spanish missions in California, brought by Spanish priests in the late 18th century and built in a unique style. After a style has gone out of fashion, revivals and re-interpretations may occur, for instance, classicism has been revived many times and found new life as neoclassicism. Each time it is revived, it is different, the Spanish mission style was revived 100 years as the Mission Revival, and that soon evolved into the Spanish Colonial Revival. Vernacular architecture works slightly differently and is listed separately and it is the native method of construction used by local people, usually using labour-intensive methods and local materials, and usually for small structures such as rural cottages. It varies from region to region even within a country, as western society has developed, vernacular styles have mostly become outmoded due to new technology and to national building standards. Paul Jacobsthal and Josef Strzygowski are among the art historians who followed Riegl in proposing grand schemes tracing the transmission of elements of styles across great ranges in time and this type of art history is known as formalism, or the study of forms or shapes in art. Terms originated to describe architectural periods were often applied to other areas of the visual arts, and more widely still to music, literature. The Apostolic Palace is the official residence of the Pope, which is located in Vatican City. It is known as the Papal Palace, Palace of the Vatican and Vatican Palace, the Vatican itself refers to the building as the Palace of Sixtus V in honor of Pope Sixtus V. The modern tourist can see these last and other parts of the palace, the Scala Regia can be seen into from one end but not entered. In the fifth century, Pope Symmachus built a palace close to the Old St. Peters Basilica which served an alternative residence to the Lateran Palace. The construction of a fortified palace was sponsored by Pope Eugene III. The Vatican Palace had fallen into disrepair from lack of upkeep, in 1447, Pope Nicholas V razed the ancient fortified palace of Eugene III to erect a new building, the current Apostolic Palace. In the 15th century, the Palace was placed under the authority of a prefect and this position of Apostolic Prefect lasted from the 15th century till the 1800s, when the Papal States fell into economic difficulties. In 1884, when this post was reviewed in light of saving money, the major additions and decorations of the palace are the work of the following popes for 150 years. In the 20th century, Pope Pius XI built an art gallery. 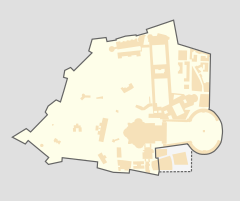 Construction of the Papal Palace at the Vatican in Vatican City, covering 162, 000m squared, it contains the Papal Apartments, offices of the Roman Catholic Church and Holy See, Vatican Library and art galleries. The Apostolic Palace is run by the Prefecture of the Pontifical Household, the palace is more accurately a series of self-contained buildings within the well-recognized outer structure which is arranged around the Courtyard of Sixtus V. It is located northeast of St Peters Basilica and adjacent to the Bastion of Nicholas V, the Apostolic Palace houses both residential and support offices of various functions as well as administrative offices not focused on the life and functions of the Pope himself. Perhaps the best known of the Palace chapels is the Sistine Chapel named in honor of Sixtus IV and it is famous for its decoration that was frescoed throughout by Renaissance artists including Michelangelo, Sandro Botticelli, Pietro Perugino, Domenico Ghirlandaio, and others. 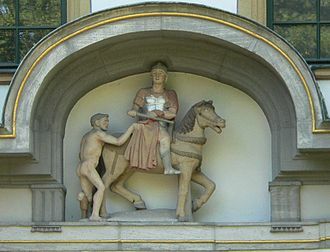 Statue of Saint Martin cutting his cloak in two. Höchster Schloss, Höchst. 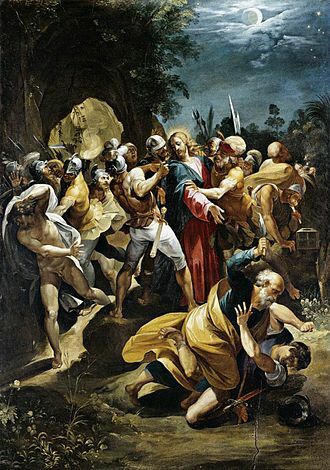 Lodovico Carracci painted St Sebastian Thrown into the Cloaca Maxima for the church at the place where his body was found (1612). The subject is virtually unique. Nicholas of Flüe, from the altar piece of the local parish church in Sachseln. A plate from the Amtliche Luzerner Chronik of 1513 of Diebold Schilling the Younger, illustrating the events of the Tagsatzung at Stans in 1481. 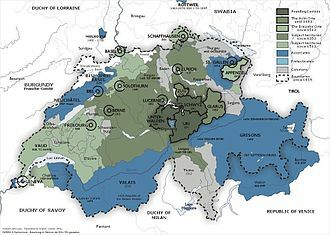 Top: A priest named Heini am Grund visits Niklaus von Flüe to ask him for his advice to save the failing Tagsatzung at Stans, where the delegates of the rural and urban cantons of the Old Swiss Confederacy could not agree and threatened civil war. 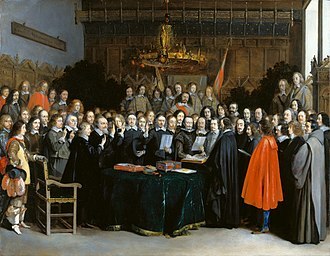 Bottom: Am Grund returned to the Tagsatzung and related Niklaus' advice, whereupon the delegates compromised. Am Grund is shown holding back a bailiff who wants to go and spread the good news already: Niklaus' advice remains secret to this day. The former Saint Joseph's Prairie Church in Washington Township, Dubuque County, Iowa. This parish ceased being an active parish in 1989, and was maintained as an Oratory until it was deconsecrated and sold in 1994. Building complex in which is inserted the National Church in Rome of Austria, Germany, the Netherlands.